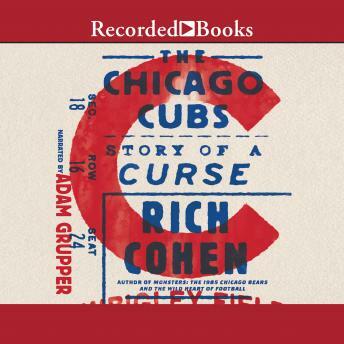 A captivating blend of reportage and memoir exploring the history of the Chicago Cubs For Rich Cohen and millions of other fans, the Chicago Cubs have always been more than a team: they've been the protagonists of a King Arthur epic, in search of the Holy Grail that is winning the World Series. A chronicle of the last few miraculous seasons as experienced through the prism of Cubs history, The Chicago Cubs tracks the famous curse, which was placed on the team in 1945 by the infamous owner of the Billy Goat Tavern, who was ejected from Wrigley Field when he tried to bring his goat into the grandstand for the fifth game of the World Series. He vowed the team would never get back to the championship. And they haven't-until now. Cohen follows the Cubs' early days as the first powerhouse baseball team, winners of the 1907 and 1908 World Series; their storied players, such as Billy Sunday, the 2nd baseman who became the most popular preacher in America; their old stadiums; their owners, from chewing gum magnate William Wrigley to Thomas Ricketts, CEO of Ameritrade; and their time between the two World Wars; all of it leading up to the momentous last World Series appearance and the breaking of the famed curse. A captivating blend of reportage and memoir, drawing on Cohen's extensive interviews and travels with recent Cubs players, owners, and coaching staff, The Cubs is a portrait not only of a team, but also of a city, of a game, and of what it means to be a perpetually disappointed fan who is finally rewarded.